Join us for a presentation by Sinead Cox who is the curator of Engagement & Dialogue at Huron County Museum. 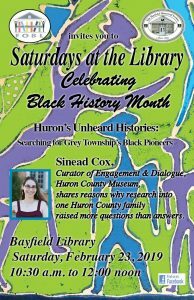 She will be sharing Huron’s Unheard histories in searching for Grey Township’s Black Pioneers. You will discover reasons why research into one Huron County family raised more questions than answers. Presented in partnership with the Bayfield Historical Society. Click here for more info about the BHS! 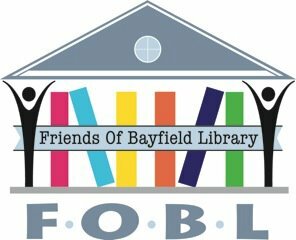 Saturday February 23, 2019 from 10:30 to noon at the Bayfield Public Library.